Now, it is no secret that Republican ideology dictates that virtually ever function of the federal government can and should be taken away from the federal government and given to either state governments or to the private sector. Instead of the US Post Office, we should have Fed-Ex and UPS. Instead of Social Security, we should have retirement funds managed by the private sector on Wall Street. Instead of Medicare, we should have "vouchers" which allow senior citizens to seek health care reimbursement from the private sector. This perspective is driven by a Republican meme which views the federal government in negative terms because it has the Constitutional authority to regulate the states as well as regulate and tax big business. 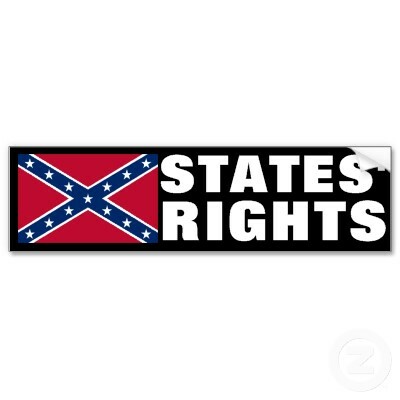 Republican ideology believes in expanding State's Rights and reducing regulations on big business. In the abstract, these seem like good ideas. States should be able to do whatever they want right? They shouldn't have to answer to the federal government. Big business should likewise be free to do whatever they want in order to earn profits right? They shouldn't have to constantly check with federal regulations and turn over a portion of their profits to the federal government. Sure, why not? Unfortunately for Republicans, the wisdom of this position is not born out by reality. Remember slavery? Slavery was a state-sanctioned program. We fought a civil war because states did not want the federal government telling them that they could no longer have slavery. Remember Jim Crow? Again, an example of states wanting the freedom to do their own thing free from pesky federal government regulation. Today, this rebellious pro-state/anti-fed attitude has manifested itself in places like Pennsylvania, Ohio and South Carolina where states have attempted (unsuccessfully) to limit the right to vote for certain segments of the population. Sorry, States, but the federal Constitution does not allow you to keep people for voting for arbitrary and/or no reason. The bottom line is that the federal government simply cannot leave every federal issue -- or even most federal issues -- up to the states. 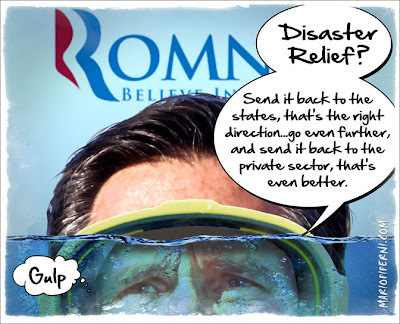 If Governor Romney had his way, FEMA would be disbanded and the job of providing disaster relief would be left up to the states. A State regularly relies on its neighboring states for help during its time of need during a disaster. So it doesn't take a rocket scientist to see that the problem with leaving disaster relief up to the states is that when you have multiple neighboring states all affected by the same natural disaster, none of them are able to help each other. The problem requires a federal solution. Although it certainly made for good political theater to a mostly conservative audience, what Mitt Romney said during the Republican Primary simply doesn't work. You cannot take the duty of responding to disaster relief out of the hands of the federal government and put it into the hands of the states (and I'm not even going to get into the private sector - charging people money for disaster relief? Please.) If you have heard any of the state governors who have been affected by Sandy speak over the past 3 days, then you have heard all of them confirm the fact that there is a real need for help from the federal government. 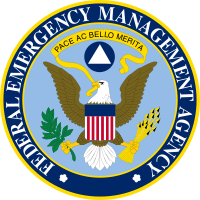 The governors are not just expressing their want for FEMA, but rather their need for FEMA. Of course, as has been the case with nearly everything Romney said during the Republican Primary, now that America has been faced with an actual natural disaster which has called into question the wisdom of his previous rhetoric, it is safe for us to assume that Mr. Romney will now tell us flat out with a straight face that he never said anything like that. 1. Should the federal government have a role in disaster relief? 2. Should natural disaster relief be left up to the states? 3. Is Hurricane Sandy an instance where political ideology is trumped by reality? 4. Will the general public believe that Romney didn't mean what he said during the primary? 5. How will Hurricane Sandy affect the general election next week?